It’s right about this time of year we could all use a few super easy recipes right? The week before Christmas always seems to be really busy getting a few last minute gifts and planning and preparing a Christmas menu, oh yeah and cleaning up the house before family stops by to visit – the funnest part, not! 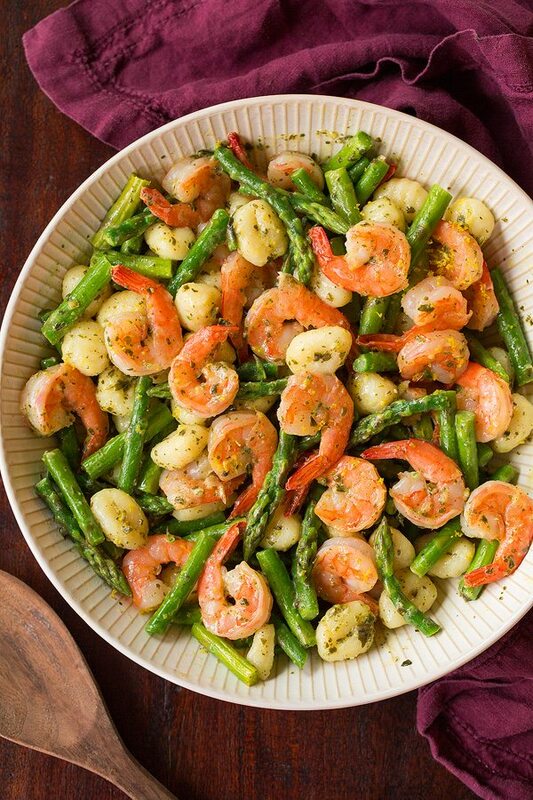 And that is where this Easy Gnocchi Shrimp and Asparagus with Lemon-Pesto steps in. Just as the title says “Easy” this really is such an incredibly easy dinner, especially if you go the store-bought pesto route. 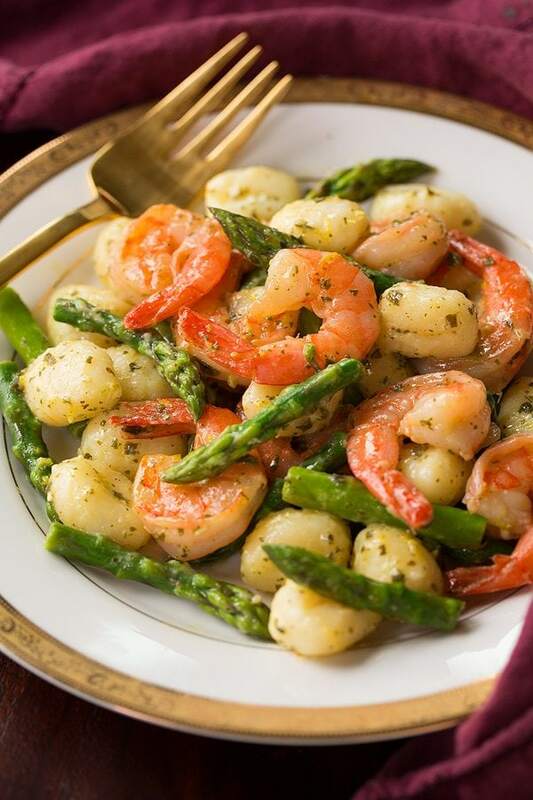 All you have to do is cook the gnocchi, then boil the asparagus in the same pot – and meanwhile cook the shrimp in a separate skillet then toss it all together with the pesto and lemon juice. Sounds simple right? Oh it is! 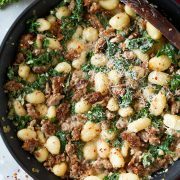 What makes this recipe so simple is also the use a of a store-bought gnocchi and not just any store-bought gnocchi – I used Delallo Potato Gnocchi. 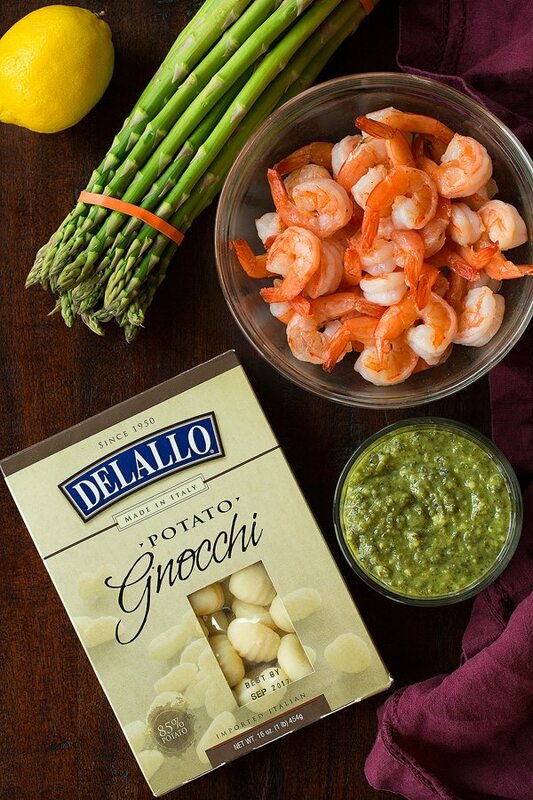 Delallo Gnocchi is actually the only shelf stable gnocchi I like. 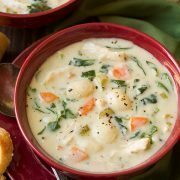 I also used it here for this Creamy Chicken and Gnocchi Soup. I love that it’s 85% potato which leaves it with a simple but great flavor. And have you tried it with shrimp? It might not be the first pairing you’d think of but it just works. An easy, flavorful shrimp and gnocchi dinner you'll want to make again and again. 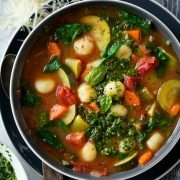 Uses store-bought gnocchi and pesto to make this a quick weeknight dinner recipe. Cook gnocchi in a large pot of salted water according to directions on package (don't drain water). Once cooked through remove gnocchi with a slotted spoon and transfer to a large bowl. Cook asparagus in boiling water used to cook gnocchi, until asparagus is tender, about 4 - 5 minutes, then drain and transfer to bowl with gnocchi. Cover and keep warm. Meanwhile heat 1 Tbsp olive oil in a 12-inch non-stick skillet over medium-high heat. Add shrimp, season with salt and pepper and cook 1 1/2 minutes then rotate and cook shrimp on opposite side just cooked through and opaque, about 1 - 1 1/2 minutes longer. Transfer shrimp to bowl with gnocchi and asparagus. Toss with lemon juice and pesto. Sprinkle with lemon zest. Serve immediately. This is a sponsored conversation written by me on behalf of Shrimp Council. The opinions and text are all mine.